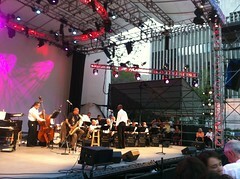 I had the pleasure of being at the final night of the 2010 Midsummer Night Swing festival at Lincoln Center last night. I and several hundred happy dancers were treated to one the finest swing orchestras in the land, the Harlem Renaissance Orchestra under the helm of Ron Allen. I've seen and enjoyed HRO for years, and they were in rare form tonight. A big highlight of the evening was the "Ambassador's Prize" dance contest, honoring legendary lindy hopper Frankie Manning. Twenty couples went out there and jammed to "Dukes Place" by Duke Ellington and Ella Fitzgerald, and then to the Illinois Jaquet classic "Flying Home." I and my lovely partner Nina Galicheva were among the competitors and had a great time doing our thing before the appreciative crowd! The video above is from the final heat. Maria Chaklai, the lovely older couple who won the 1st prize, and to everyone else who competed! It's apropos that for a contest to honor a man who danced well into his 80s that we should give the prize to our elders. Good times, good times. The end of the evening was bittersweet, as the final night of the festival. We don't get to see enough of HRO in New York City unfortunately. So thanks to Lincoln Center for booking one of our favorite swing bands. And special thanks to Bill, Jill and all of the MSNS organizers for putting together another fantastic celebration of music and dance under the stars. They clearly were attentive to the wishes and needs of the dancers, big and small — from the bands and DJs they hired, to setting up tables so we could bring in water bottles, and even putting down powder on the dance floor when we complained about how sticky it was. Midsummer Night Swing is one of the best parts of a swinging summer in New York City! go out ballroom dancing 2-3 times a week, 52 weeks a year. " Congrats, Sid and Maria! The winners were judged at the end of the final round by applause. a 7th couple to be included in the finals. Thanks for the kind words, and great report about the closing night. We’re glad to see all our efforts were appreciated. The winners of the contest are Sid and Maria Chaklai. Maria is a former ballerina, who used to tour the world in various companies. She and Sid are the first on the dancefloor almost every night at MSNS, and go out ballroom dancing 2-3 times a week, 52 weeks a year. We had some great dancers last night in the contest, you included, but the crowd were definitely on their side – watching them dance is so joyous and affirming. By Liz, did you mean, Liza Minelli, who came to enjoy the HRO and Frank Wess? Or Jill Sternheimer, our associate producer? Thanks again for all your support of Midsummer Night Swing. OMG that really WAS Liza Minelli! that’s awesome. Sorry, I did mean Jill. I’m terrible at names.